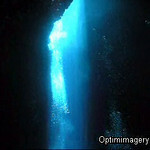 Then one more look at the dancing beams before we head out the cave entrance (to your left) and back to the Sun Rider. By the way, anyone curious about this "t" fellow who obviously would prefer to live in a time before video, and indeed apparently in a world without color (sorry, Tom, I couldn't resist), click on "optimimagery" above left to navigate to my home page. Then click the album category "other," and open the album about "Casey, Mighty Casey." There are stills and video there. Somehow, I think the album would be totally lacking if I had not included the videos, as poor quality as they are. Well, I do hope that we have some discussion here, good natured and friendly. Tom ("t") is a very supportive friend and excellent photographer. We raz each other a lot. I do respect his opinion. In fact, in areas having to do with artistry, I think he has an eye for things which basically escape me. It is quite possible (perhaps even likely) that I am missing something here, in fact. Let me know! More like comparing a drum beat to a melody. This is an ALBUM. It can have more than one medium. It's OK to see the different aspects as going together to make up a more complete whole. But I guess some of us see new things as limiting, while others see them as allowing more freedom of expression. I still don't see how any of the stills herein have lost anything at all from the inclusion of the videos. Anyone else have an opinion? Please comment!